I'm slightly late writing this due to a combination of work and a teething E, followed by her then being poorly! Friday 1st November saw us having our 20 week scan. 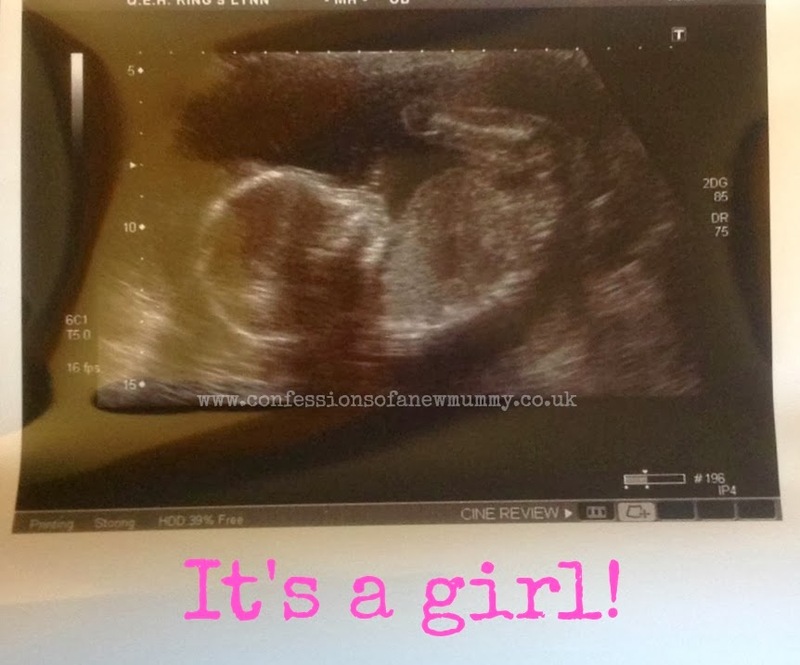 We had decided to find out whether we were having a boy or girl before hand (as we did with E), so I was beyond excited! And impatient, it seemed to take forever to get to 20 weeks! The sonographer was great, she pointed out everything that she was looking for and what was showing on the screen as she went along. Everything seems to be looking healthy and normal and as it should. The sonographer checked that we definitely wanted to know what we were expecting and when she said we were having a girl, I was thrilled. Tears were shed, I was pretty certain that we were having another girl (I wanted another girl!) but I hadn't wanted to get my hopes up in case I was wrong. At E's 20 week scan, comments were made about her measuring on the large side and the sonographer, when asked by us, 'guess-timated' her birth weight to be around 10lb. This worried me endlessly, the thought of giving birth to a big baby! So I was very relieved that no comments were made this time around about our baby's size! 2 or 3 days before the scan I started to properly feel baby moving and since then the movements have become more frequent and much stronger. I love this part of pregnancy, the chance to start bonding. No one else can see or feel what's happening, its just me and her and it feels amazing. Congratulations again! Those movements are so special, a bonding just between you and bub. I'll miss them when he's here!